This ancient site, 31 miles (50km) south of Corinth, bears the remains of the ancient palace and citadel of Mycenae, a place of archaeological controversy but fascinating for the lay visitor. Homer's fabulous story has it that the kingdom of Mycenae was dripping in gold and revelling in riches before King Agamemnon decided to lead an assault on Troy, back in about 1,250 BC. The king started a war that lasted a decade, battling to win the impossibly beautiful Helen of Troy back from Prince Paris. German archaeologist Heinrich Schliemann discovered Mycenae, which he believed gave credence to Homer's tale, in 1874 after he had excavated the remains of Troy itself. 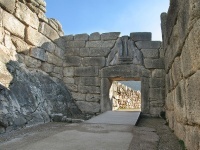 There is no doubt that Mycenae was a city of power and prosperity and the ruins, from the Lion Gate (oldest example of monumental sculpture in Europe) to the palace complex, houses and beehive tomb of Agamemnon, are well worth exploring. Most of the more exceptional finds from the site are on exhibit in the National Archaeological Museum in Athens. These include frescoes, gold jewellery, and the gold mask said to have belonged to Agamemnon, among other priceless pieces.